This illustration depicts the Thales Alenia Space concept for the Euclid spacecraft. When the European Space Agency's Euclid spacecraft launches in 2019, it will kick off an ambitious mission to map more than 70 million galaxies with a single goal: shining a light on the invisible dark matter and dark energy binding the universe together. Named for the ancient Greek mathematician, Euclid will peer into space in the visible and near- infrared spectrum in search of signs of dark matter and its counterpart, dark energy. Both are challenging because they cannot be measured directly. Instead, astronomers measure the phenomena by their gravitational influence on visible matter, such as stars and galaxies. "Euclid is designed to study the dark universe," Bob Nichol, Euclid Consortium Communications Lead, told SPACE.com in an email. By tracking the movement of celestial objects, scientists have determined that more matter exists than can directly be accounted for. Known as dark matter, the unseen material can only be studied as it warps the space-time surrounding other, visible objects. 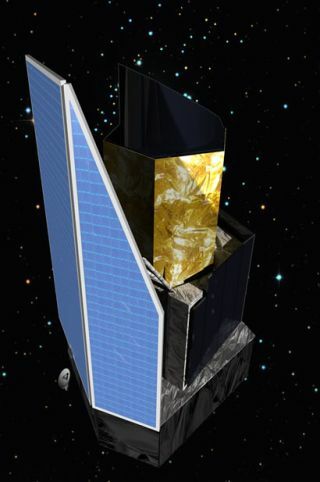 The high sensitivity of the new Euclid space telescope will aid scientists in the search for the elusive material. "Euclid will deliver images of Hubble-like clarity across a third of the sky," Nichol said, referring to the iconic Hubble Space Telescope that has snapped amazing space images for more than 20 years. "Such a measurement is impossible from the ground." Astronomers will use the new measurements to search for the small distortions caused by gravity. Just as a glass lens deflects light waves, gravity also changes the way light moves. Using Euclid to spot the warps in space-time, astronomers will be able to pinpoint dark matter with greater precision. Dark energy is at least as challenging to study, though its existence drives the expansion of the universe. Although it makes up most of the cosmos, very little is known about what it is or how it functions. But studying dark matter can lead to insights for the pivotal force. "Through measuring how the amount of dark matter changes with time, we can constrain dark energy," Nichol said. The telescope will also map the sky, examining the emissions from more than 70 million galaxies, 10 times more than scientists can study now. The galaxies aren't sitting still in one place, but are moving away from the Milky Way and each other. As they move, their light waves are stretched out behind them. By calculating the waves' alteration — known as their redshift — astronomers can determine how rapidly the galaxies are traveling and how far they are from Earth, as well as determining their three-dimensional position in space. Combing the three-dimensional galactic positions with the detailed information on dark matter will allow scientists to improve their estimates of the dark energy and dark matter evolution. To answer some of the questions about the makeup of the cosmos, almost 1,000 scientists are working together to plan and construct Euclid. "The size of the collaboration is a reflection of the community interest in the mission across Europe, and in the world," Nichol said. Scientists from fourteen countries are working to build the instruments and to study the resulting images. While the payout should help provide clues about dark matter and energy, Nichol says it will also be a "goldmine" for other research fields. "I expect Euclid to revolutionize many aspects of astronomy." Follow SPACE.com @Spacedotcom. We're also on Facebookand Google+.